Why Are They Suing So Many Appraisers? The grand scheme of suing appraisers! Who Is Llano Financing Group? Who Is Carrington Capital Management? Why Are They Suing So Many Appraisers? Short Summary Update 8-17-15: Hundreds of appraisers are being sued by two entities that invest in suing appraisers for profit. At this time, the entity filing the most lawsuits against appraisers is Llano Financing Group, and most of the appraisals it is suing over were held by Impac Funding/Impac Mortgage. Impac is expressly assigning its claims and rights to sue appraisers to the investors (according to the court complaints). In the last three months, the investors have sued about 280 appraisers in Arizona, California, Colorado, Florida, Illinois, Indiana and Nevada. First Round. Last fall on this blog and also in the Appraisal Institute’s Valuation magazine, I wrote about several entities involved in purchasing foreclosed debt from lenders and then filing lawsuits against appraisers asserting professional liability claims. 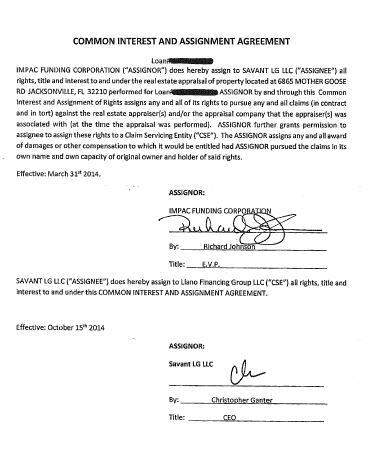 Those investment entities were Mutual First LLC and First Mutual Group LLC; and in the background, there were Savant Claims Management and Savant LG. The earlier blog article is here. In a first round of litigation, those entities ultimately filed more than 100 lawsuits against appraisers in Texas, California, Florida and New Jersey. So far, it’s been a spectacular failure, showing a lack of due diligence by the investors or their advisers — diligence that should have uncovered the operators’ track record of failure and the court judgments against them by prior unhappy investors in other ventures. 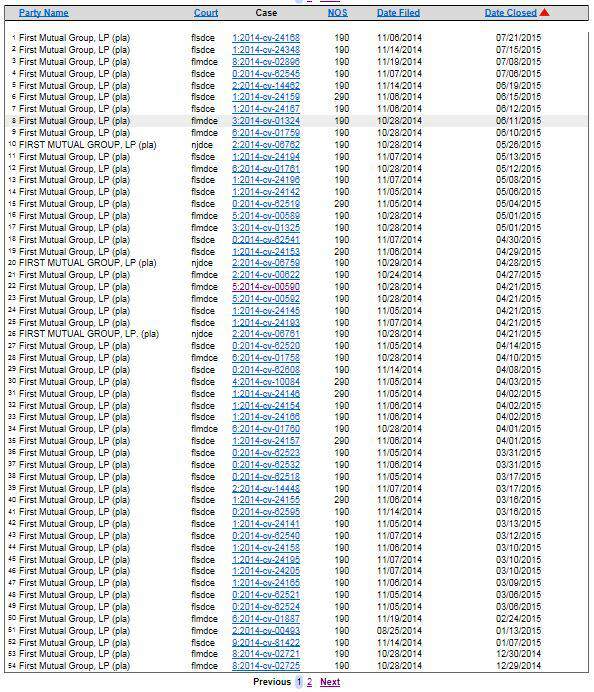 I don’t follow every case filed by Mutual First and First Mutual Group, but I have looked closely at most of them and I have not seen a single case among the first 100+ in which the investors actually recovered any money from an appraiser. In fact, more than 80 they filed already have been dismissed by the courts in Texas, Florida and New Jersey because of blundering by their “legal team.” Many of those cases were dismissed even when the appraiser defendants didn’t show up to defend. Meanwhile, here in California, one of their law firms is seeking to withdraw from working on cases because First Mutual Group has failed to pay them. According to court filings by First Mutual Group, the losing investors behind this entity were two British private equity firms: Alternative Capital Strategies LP and ACS General Partner Limited. Second Round. Despite the losses and problems in the first round, there is now a second round of cases being filed by different investors. This round is being led by Llano Financing Group LLC, which also acquired the rights to sue appraisers from the same sources. Like the other entities filing lawsuits, this is an investment entity, not a real lender, though its name might have been chosen to sound like a lender. It acquires the purported rights to sue appraisers from lenders or mortgage investors in connection with loans that long ago went into default and were foreclosed. Llano did file nine cases in the failed first round — mistakenly using the wrong name “Llano Funding” — and seven of those cases have been dismissed against it to this date. Another entity recently filing such lawsuits against appraisers is Carrington Capital Management — which is apparently under the same umbrella of ownership as Carrington Mortgage. While the lawsuits being filed now relate to old appraisals, appraisers and appraisal firms/AMCs very seriously need to weigh the liability risk that the lenders involved in this large scale legal assault on appraisers are creating for them with regard to current and future appraisal work. Impac is expressly selling and assigning claims to sue real estate appraisers (according to Llano’s lawsuits against the appraisers), and Carrington Capital itself is directly using appraisers based on assignments that it purports to purchase. This is unprecedented hostility to appraisers by these lenders/mortgage investors. The latest lawsuits have been filed in California, Florida and Colorado. In the last 3 months, based on assignments provided by Impac Funding, Llano has sued about 270 appraisers and appraisal firms (from the smallest firms to the very largest). Carrington Capital has sued about 10. Both Llano and Carrington Capital are using different lawyers than in the first round. My estimation is that they lost confidence in the predecessors or did some due diligence regarding the backgrounds and experience of the parties with whom they were dealing. The primary law firm now representing Llano in Florida, where most of the new cases have been filed, is McCalla Raymer, LLC; this a large Southeast regional law firm that does done high volume mortgage foreclosure work for lenders. Although the grand scheme of suing appraisers for profit has failed to this date, Llano and Carrington Capital do seem a little better organized, and appraisers dragged in should take the lawsuits seriously, get legal representation and start mounting their legal defense — and all appraisers should carefully weigh whether they are willing to work for the few lenders like Impac Mortgage that sell rights to sue them. and people still cant figure out why so many appraisers are leaving the business . . .
oh, thats right – appraisers are getting OLDER. And new appraisers appear to be more intelligent as well; intelligent enough to stay at least 10,000 away from this “profession”. Outstanding article & many thanks to the author! It’s pretty clear that they are going after the E&O insurance folks. That’s bad enough because those suing are nothing more than financial parasites. Legally entitled to sue, but basically pond scum never the less. We ALL need to make sure our work is more defensible; and hope our E & O providers know how slippery the settlement slope is, and fight for us every time. But, that’s not always realistic. THAT is why you ALSO need to join the American Guild of Appraisers! We stand by our members. That help may be in the form of assisting your E&O providers in defending certain aspects of the appraisal, or helping you with your response to the state. You MAY find that you need someone that is on your side dealing with your E & O provider as well. Call BEFORE it is too late! Email Janbellas@appraisersguild.org now. Last item, if YOU are getting less than customary and reasonable fees in your area, we want to know about it! With Coester VMS recent consent stipulations back east, and B of A s huge settlement announcement NOW IS THE TIME for us to be looking for someone to represent us in a class action suit! I’m especially interested in assignments that paid low but required more than 8 working hours work start to finish. I can ONLY sell rights that own. My client may think they have ability to sell a ‘right to sue’ me, but clearly courts have disagreed. I’m wondering if we can do something to short circuit this right up front? Does a lender even have an ability to sell a right to suit? Is my appraisal not then being used for a purpose for which it was never intended? What are the standards of appraisal that the purchasers THINKS they have acquired? Are they provided with a copy of the original appraisal order so that the SOW is clear? E&O insurers need to be counter suing or cross complaining about ‘frivolous’ lawsuits. Its beyond the abilities of most individual appraisers, but if there have already been 200 such cases, it seems reasonable that E&O carriers would end the flood by filing cross complaints in every single case.